Found 17 file extension associations related to XTreeGold and 16 file formats developed specifically for use with XTreeGold. XTree is file manager software originally designed for use under DOS. It was published by Executive Systems and first released on 1 April 1985 and became highly popular. Although the user interface was composed of text characters, it had many graphical elements, especially when XTreeGold was released in 1989, and pull-down menus were introduced. 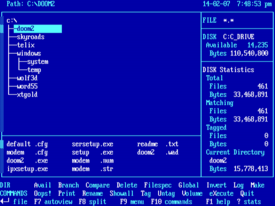 The program filled a required niche in the market, as DOS shipped with no graphical file manager, until the generally unsuccessful DOS shell that was provided with MS-DOS 5. Even at this point, the speed and features of XTreeGold were superior (specifically support for the ZIP compression format and ability to undelete files). The program also had the benefit of requiring very little memory, essential at a time when less than 640kb of memory were available for programs to run. XTree suffered a terminal decline after the widespread adoption of Microsoft Windows. The built in Windows file manager had a vaguely similar appearance to XTree, and while it lacked the speed, keyboard shortcuts and power, it did benefit greatly from being included with Windows. Even in its earliest version XTree contained features like listing all files of a branch including subdirectories, listing of all files on a disk, or viewing a file's contents in text or hexadecimal format (regardless of its file extension), that the Windows file manager is not capable of even in its latest Vista version. In 1992 XTree for Windows was released. The product was a disaster for XTree Company who had dropped many of the features liked in the DOS versions. In 1993, the XTree Company was sold to Central Point Software, which was in turn acquired by Symantec in 1994, and in 1995 production of XTree products was halted. The XTreeGold software seems to be old or discontinued. If you need more information please contact the developers of XTreeGold (Jeffrey C Johnson (XTree Company)), or check out their product website.